mondayMEDIA, the parent company of GemsTone, began in 1996 as a consulting company highlighting graphics and website creation by Anna Monday. In 2005, mondayMEDIA also became an audio/visual label with the release of several CDs and DVDs of new and archival materials drawn from audio and video recordings engineered and produced by Jon Monday , as well as recordings licensed from the Hollywood Vedanta Archive. THEN: Jon filming Pat Benetar in make-up for the Get Nervous album cover photo session (1982). For the past 30-plus years, Jon Monday has been recording events; first audio recordings and later, when affordable camcorders became available, video recordings. The events were fundamentally two types: lectures and gatherings at various Vedanta Societies and videotapes of the Los Angeles music scene of the late 70s and early 80s, which he observed in the roles he played as general manager of Takoma Records and later as head of marketing at Chrysalis Records. Presently, mondayMEDIA is digitizing, authoring, and distributing products on CD and DVD, as well as creating, producing, and directing new documentaries. As a corollary, mondayMEDIA is issuing and re-issuing sacred and metaphysical projects released on the separate GemsTone label. For the past forty years both Jon and Anna Monday have been practicing Vedantists and members of the Vedanta Society of Southern California. 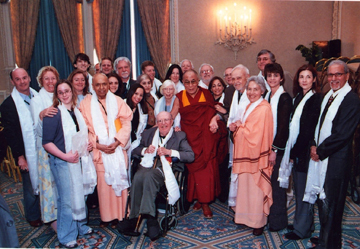 While living and working in the San Francisco Bay Area during the 1990s, Jon served on the Board of Directors of the Berkeley Vedanta Center . GT1001-CD – Swami Prabhavananda – What Is Religion? GT1013-CD – Aldous Huxley – Who Are We?